First off, I certainly applaud them for this move. If you aren’t familiar with this game, it can be all encompassing in such a way that you become attached to players you’ve developed through the ranks or taken a chance on after doing significant global scouting. You go to “war” with these players on the pitch and words can get exchanged off it. The alternate world you create with each new game created can become engrossing. To add this level of player development is both interesting to the game and socially. Players have had emotions in past incarnations of the game. Something generally stuck on a happy to sad scale revolving around playing time, relationships within the club, and at times homesickness. Adding sexual orientation provides a level of social complexity to players that continues to make these imaginary players feel more authentic. The most important aspect of this new feature is the chance to normalize gay athletes in sport, hopefully providing both healthy conversations as well as some foundations for real life athletes to feel less stigmatized. Pondering the implications of this feature has had me wondering what other elements of daily life could be added to the game to make it more socially accurate. Muslim players who fast during Ramadan perhaps? Lifestyle choices like a player taking up yoga or a healthier lifestyle to prevent injuries? I’m sure the list could go on. The Football Manager team have long put social issues front and center with their game. From the “Kick it Out” anti-discrimination campaign, the “Show Racism the Red Card” graphic that for awhile graced the intro montage, to the signboards in the most recent game featuring ads for the “The Street Football Association” and their long-time support for War Child. By promoting these social issues in a game, a game that is played by mostly men from the ages of 16-30, around the world, you can quietly create a level of consciousness. Having played the game for more than a decade, I’ve never felt preached to by the Football Manager’s graphics, more it gave me a sense of awareness about organizations and ideas that I wasn’t thinking about previously. I’d imagine it would do the same for other young men who maybe haven’t ever given a thought to the some of the issues brought up subtlety in Football Manager. I’ll be on the look-out for the first player on my team to be brave enough to come out as gay, even as I begin my traditional march from the English Conference to the Champions League. 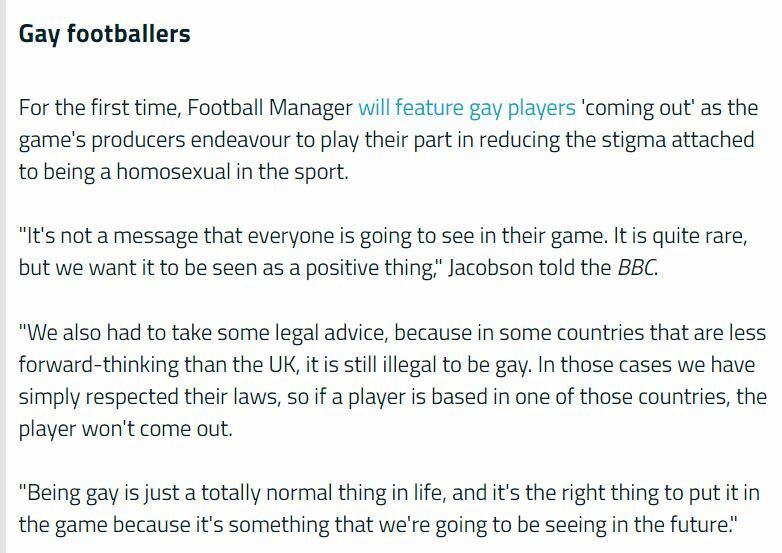 It’s no bad thing to finally remove the stigma homosexuals face in sport – it should be considered straight-forward and normal, for it is. Now, if only it becomes normal for Liverpool to win things!